Dr. Muneeba completed MBBS from Govt. Medical College Calicut. 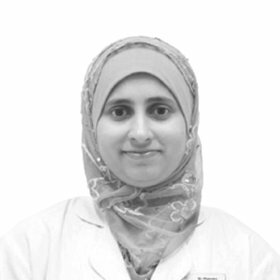 Since December 2008 till date, she is working in Alnoor polyclinic Deira, Dubai as a General Practitioner attending outpatient cases, emergencies and arranging ambulance transfers to hospitals when necessary, as well as performing minor surgical procedures. In 2001, she worked as an RMO – Gynecologist in Arafa Hospital Changaramkulam, Kerala in India, attending out-patient cases, conducting normal delivery / minor gynaecological procedures, assisting major gynaecological surgeries, managing in-patients, and attending casualty cases. When she came to Dubai in 2005, she worked as a General Physician. During that time, she was attending cases in emergency department and minor surgical procedures, also have conducted normal delivery and monitored Pre-labor room, managed the ICU including cardiac patients(Cath Lab) and in-patients including medical/surgical/obs-gyn.